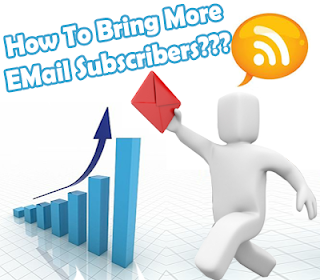 How To Increase Your RSS Subscribers In Large Numbers? The List of tons of subscribers does bring a splendid delight to a blogger and a webmaster. It does give an enormous boost to their confidence, due to which they work hard and try their best to improve their Blogging skills. In reality, catching the interest of thousands of daily Rss Feed subscribers appears to be a real gigantic task. Nevertheless, it is not impossible. There are many striking ways which could be utilized handsomely to pull off your first Rss Feed Subscription. The probabilities of increasing your Blog Subscribers are extremely high, if you uphold perfection. The question is not about, how we will use these methods, it's about how these methods cannot be used. So today we will study, how we can increase our Rss Subscribers using Email Subscription. Undoubtedly those blogs always receive exposure, which has tons of daily loyal subscribers. Even excellent advertising companies like Buysellads.com and Google Adsense only accepts those publishers, who own a community with heaps of daily subscribers. So it's vital for every publisher to make use of every possible opportunity. There are no two opinions, that subscribers give an enormous exposure to your blog. So when you will publish new articles to your blog it will automatically send an email to your subscribers. Adding a subscribe Box to your blog is the most logical way to convert your readers into subscribers. The subscription box allows your readers to sign up for your free newsletter updates. To make this system whole lot easier, you can use Freeburner.com which is among the top most website feeds provider. The biggest reason behind its success is its perfection. And using this outstanding service we can easily enable email subscription service and can add an Email subscription widget to yourblog. It also allows you to personalize your newsletter’s outlook. Furthermore, you can even schedule the newsletter mailing time. There are many other alternatives of feed forwarding but according to me Freeburner.com is the only one which has so many features, which does attract us like a bee to a honey. If you want to build subscribers in quick succession, then you can use pop out email subscribe now box. This will bring lots of targeted subscribers. Give and take is not a new trend. It’s an ancient term, where people use to trade their goods. In an identical way, we can offer an excellent deal to our readers, only if they subscribe to our community. No doubt it is among the most dedicated ways of building subscribers. You may fancy this method, but truly it’s successively running since centuries. If you are in a scenario, where you are short of money then you can consider few alternatives. If you think you are first-class designer, then you can design attractive logos for your visitors who have subscribed to your community. This will act as subscribe and take a logo scheme, which will become a center of attention for your readers. You can run an online competition for your subscribers. And as a reward you can offer a paid software copies to the winners. This will surly bring a new beginning to your subscribers. Tell your readers About the Advantages of subscribing to your blog. Why your readers should choose you? On this occasion, you need to convince your readers that you will provide them with quality guidance, while maintain uniqueness. You need to prepare a proper article, where you should tell them the pay back of subscribing to your blog. In the end, you need to encourage your loyal readers to subscribe to your blog. Well every one promotes equality but if you want to see yourself on the peak, and then you must give more significance to your subscribers. You can offer them a special section on your blog, where they you can solve their problems by providing them frequent answers. This could encourage users to become your subscribers, and remember you are giving free consultant to your subscribers. So this amazing offer will definitely click the brains of your subscribers because these days nothing is free. Content is king, how many times we will quote the same quotation. This quotation is so amazing that we cannot stop our fingers to nail it again and again. Content could prove to be an enormous factor in building the millions of subscribers. And astonishingly this is the prime secrete of those websites which has tons of daily subscribers. You need to create highly-professional content to make your readers think, that they must subscribe. This could appear unprofessional, but truly this could bring massive subscribers. If you have a blog then you must have reader, and if you have readers then they must comment on your blog. So you just need to help your readers through commenting and in the end you can ask them to subscriber to your blog. Don’t forget the mantra helping others is a noble cause. From The Editors Desk: Finally in the end, you can breathe freely with affection. If you follow the above guidance correctly then I can put my money on your blog that it will get tons of daily subscribers. If you feel confused at any point, feel free to ask. Peace, blessings and happy subscribing.